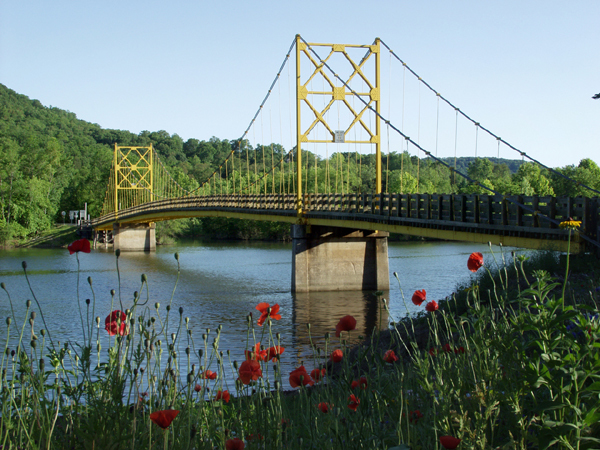 Beaver Bridge; Popular with locals and visitors alike, no visit to Eureka Springs is complete without a ride over this one-lane suspension bridge called "The Little Golden Gate". Local efforts have so far been effective at putting off the Ark. Highway Dept. 's move to replace it with a modern bridge. The structure is listed on the National Register and highway 187 is a great short ride out of Eureka Springs. We want to take a moment to remember our friend, "Flyboy" David Piepenbrok, of Fayetteville, Ark. He loved his family, was a commercial pilot and loved flying, loved motorcycle riding and was a regular at Roscoe's (see his picture above and at left). A nicer guy you'll never meet. We all know fallen riders and vow always to remember them. All the regulars at Roscoe's will remember him fondly. Please ride safely in the Ozarks. 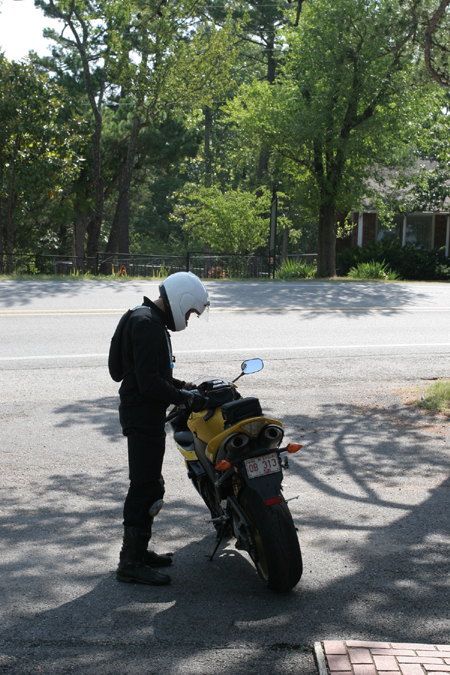 Winding into Eureka Spring; The ride into Eureka Springs is a beautiful drive... but its even more fun on two wheels. Heeling over into a curve on a sweeping turn is shear joy. 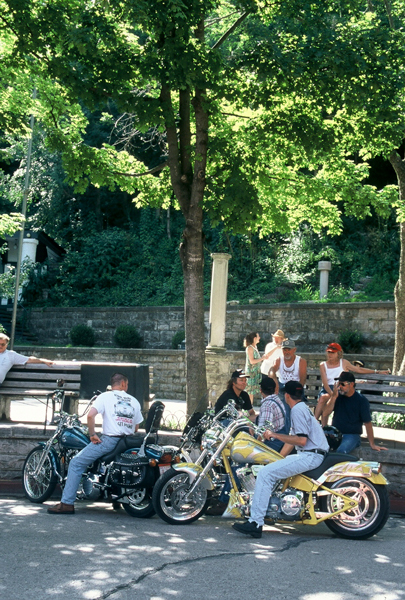 Local Riders at Basin Park; Basin Park is one of the historic springs that give Eureka Springs its name. 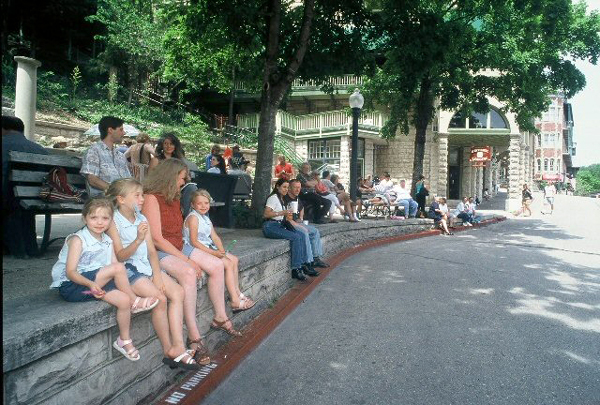 It's a gathering place for local and visiting riders as well as tourists on four wheels. 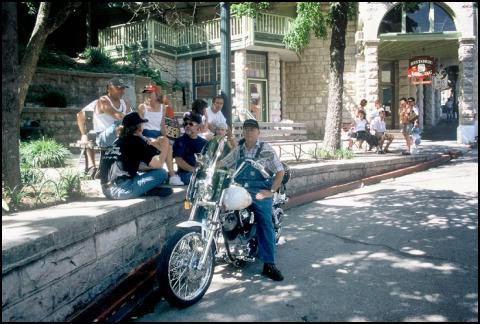 Bikes on Spring Street; Spring Street, main drag through the 1890s Victorian town of Eureka Springs. Because of the unique character of the city, as well as its proximity to great riding, Eureka has become a popular location for riders. 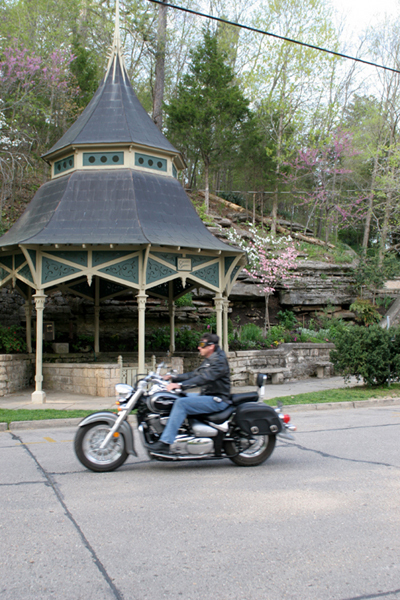 Eureka Springs Rider; The Historic Loop through Eureka offers a great ride through the heart of the city. Remember to be a courteous rider, run at idle, and don't rack your pipes in town. Not everyone enjoys the sound of straights rumbling through the canyon-like walls of downtown. Highway 62 West; Highway 62 West out of Eureka Springs offer some exciting stretches of road offering hairpin curves, tight turns and beautiful scenery. 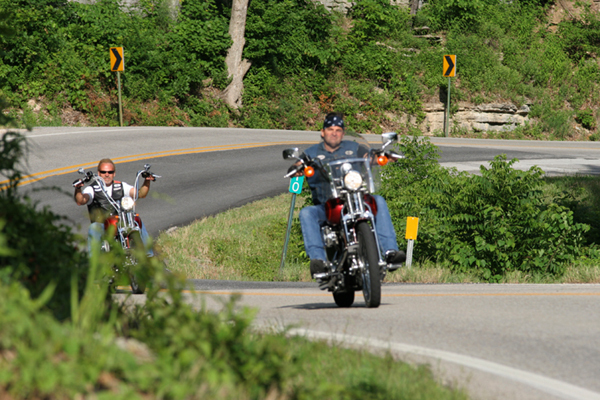 Wonderful 62; Highway 62 west of Eureka Springs offers an exciting ride and the city a great destination for all riders. 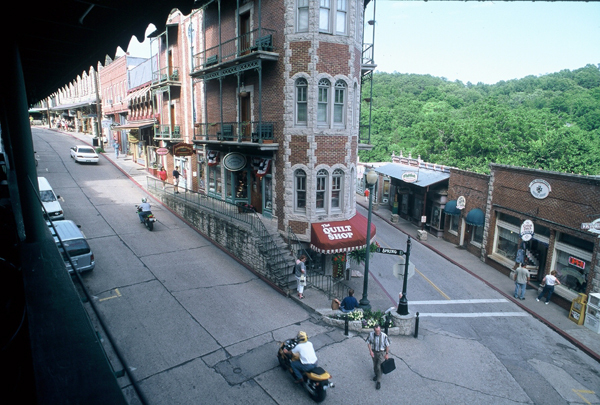 Eureka Springs, Arkansas; This Victorian town is a favorite destination for riders to the Ozarks. 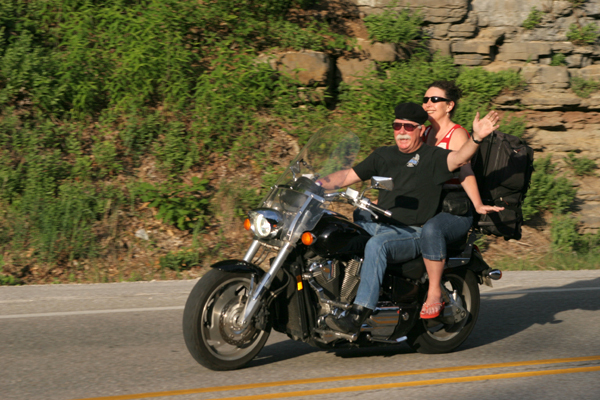 It's quaint charm and old-world qualities are matched only by the quality and excitement of the roads in the Ozarks. Shown here is one of the over 63 springs which give rise the its name. The springs were purported to have medicinal properties and were used as such by both local indians and white settlers as such through the early 1900s. Spring Street is an inviting place to just relax. 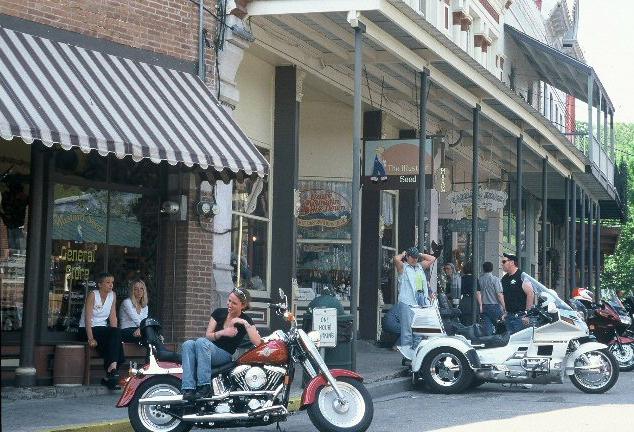 Motorcycles of every brand and style ply the streets Eureka Springs. 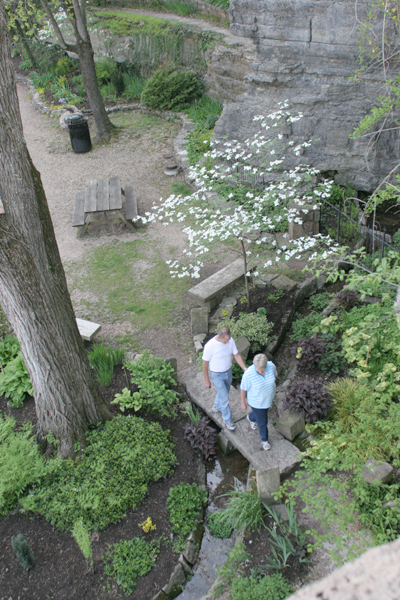 Summer at Basin Park; Basin Park is one of the 63 historic springs that give Eureka Springs its name. It's a gathering place for locals and visitors alike. Many historians think that the springs of Eureka Springs many have been the source of the legend of the Fountain of Youth, sought after by the Spanish explorer DeSoto. The Flat Iron Building; Just up from Basin Park is the Flat Iron Building, at the split of Spring St. and Center Street. 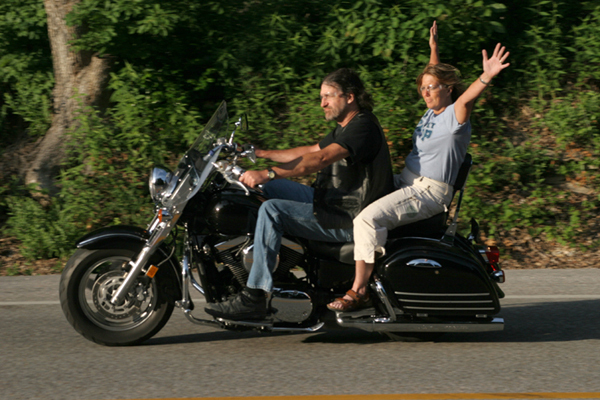 The Highways Around Eureka are Fun; If you don't have fun on two wheels in the Ozarks, somethings wrong. Great scenery, serpentine highways, laid back culture. 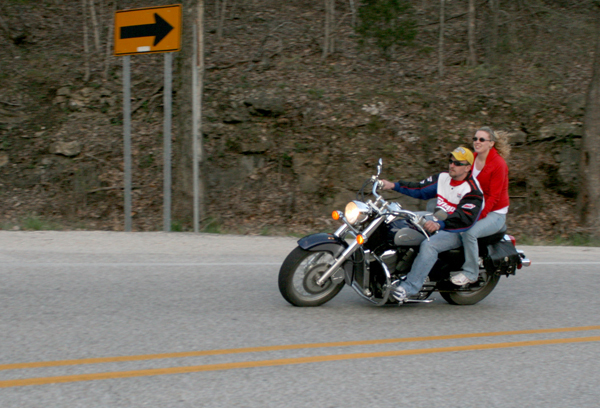 Friendly Riders on Highway 62; You're going to meet a lot of friendly people in the Ozarks... like these folks on Highway 62 west of Eureka Springs. Wave back, give a nod, or just a lift of the left hand. 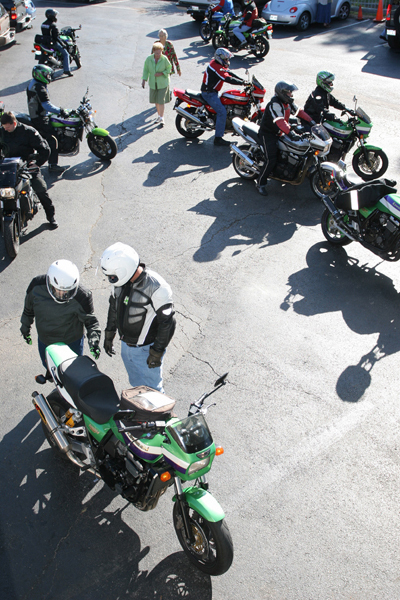 Z Riders Rally; Whether you ride alone or with others, you'll be sure to meet others who share you interest in the open road in the Eureka Springs and the Ozarks. These Z riders enjoyed a rally in Eureka. You Meet the Nicest People... in Eureka Springs. Eureka is a great destination for riders.